Nancy Pelosi would like to be House speaker again. A whole bunch of Democratic senators would like to be their party's 2020 presidential nominee. These two goals just collided head-on. The Washington Post's Kelsey Snell and David Weigel report that Pelosi is declining to endorse Bernie Sanders's “Medicare for All” single-payer health-care legislation. She is also cautioning her party against making it a litmus-test issue. Five senators who are top 2020 contenders have signed on to Sanders's bill in recent days, a sudden wave that has some — including me — suggesting that we were quickly headed in that direction. Pelosi is clearly reluctant. “I don’t think it’s a litmus test,” she said. “I think to support the idea that it captures is that we want to have as many people as possible, everybody, covered, and I think that’s something that we all embrace.” She said she's focused on protecting the Affordable Care Act. This is hugely telling. Right now, single-payer is a largely hypothetical exercise for 2020 aspirants. It's a way for them to prove their Sanders-esque progressive bona fides and prevent one another from outflanking them on the left. And it has the added benefit of not being something any of them will have to deliver upon — unless and until they're elected president. For someone like Pelosi, though, it's problematic. If Democrats are going to retake the House (or even the Senate), they need to win in red territory where government-funded health care is a much, much tougher sell than in a Democratic presidential primary. Democrats need to win several red states and many conservative-leaning districts to regain their majorities, period, just because of how our population is sorted — not to mention gerrymandering. The moment all the leading 2020 Democratic contenders jump on board with this and the moment this becomes a Democratic Party platform plank — either officially or unofficially — is the moment that those red-state and red-district Democrats are backed into a corner. A telling example is Sen. Jon Tester (D-Mont.). After I noted Monday that he had said Democrats should take a “solid look” at single-payer last week, his office sought to play down those comments and pointed out that he voted against it in July, when Senate Republicans forced a vote. Tester is up for reelection in 2018 in a red state, and national Republicans have attacked him for the “solid look” comments. Another analog is the Democrats' internal debate over abortion — which happens to be another example of Pelosi telling her party to slow its roll to the left. Back in April, Democratic National Committee Chairman Tom Perez said every Democratic candidate needed to support abortion rights. “That is not negotiable and should not change city by city or state by state,” Perez said. The problem: Lots of Democrats and Democratic voters don't toe that line. And Pelosi, along with Senate Minority Leader Charles E. Schumer (D-N.Y.), quickly rebuffed the new DNC chairman. Look: Pelosi is a liberal's liberal if there ever was one — the kind of member who should, by all rights, be on board with single-payer. But she also knows politics, and she knows becoming speaker again requires pragmatism rather than grandstanding. Some Democrats may truly believe this is where their party should be right now and that it's the right thing to do; Pelosi knows making that case could unnecessarily complicate Democrats' hopes of gaining any power in Washington before 2020. 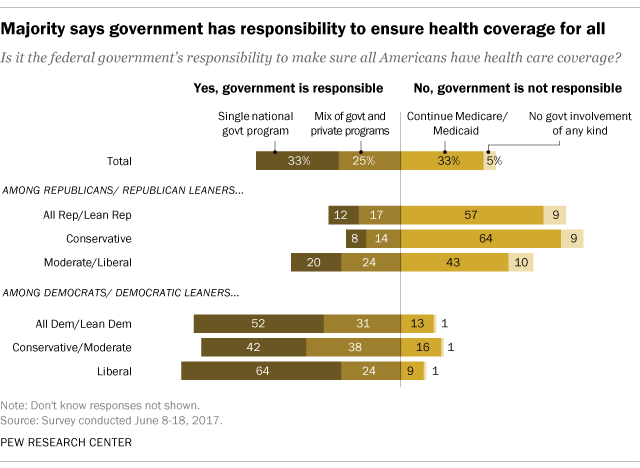 A Pew Research Center poll in January showed that just 33 percent of Americans supported a single national government-funded health-care program, when given a slate of options. But support was 52 percent among Democrats and Democratic-leaning voters and 64 percent among liberals. Those 2020 candidates are very concerned with that 64 percent — and understandably so. But Pelosi needs to worry about winning support from more than 50 percent of voters — including many who just aren't there on government health care. In this collision, single-payer may be the unstoppable force, and Pelosi the immovable object.